Volunteers running a mobile cinema on Anglesey are looking for a lifeline to keep it going. 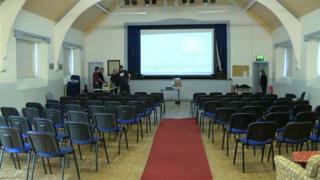 Sinimon was set up in 2017, and takes a high-specification projector, screen, sound and lighting rig to village halls and community centres around the island to show current films. It was set up to help bring communities together and give people a chance to see films without having to travel far. But funding will soon run out, after 20 screenings serving 1,700 people. Contract manager Peter Davies said: "None of them have been advertised - it's all been by word of mouth. "It's been a great way to get people around the island to come together, and to generate something positive for the place where they live. "The stand out thing is people clapping at the end of the film, or saying they haven't been to a cinema for 15, 20, maybe 30 years, and how good it is for the island to have something like this." Children also helped plan the events with youth work organisation Llais Ni, selling tickets and popcorn. Mari, 13, from Llangoed, said: "We fell in love with the idea of having a cinema night. People have said they really enjoy it." The Sinimon team is looking at applying for more grants and has bought new projection equipment to allow them to play adverts before the film.